At CES today Toshiba has unveiled their newly updated Dynadock U3.0 universal USB 3.01 docking station. Design to provide you with one cable docking convenience by acting as a central hub for peripherals and providing more desktop space. 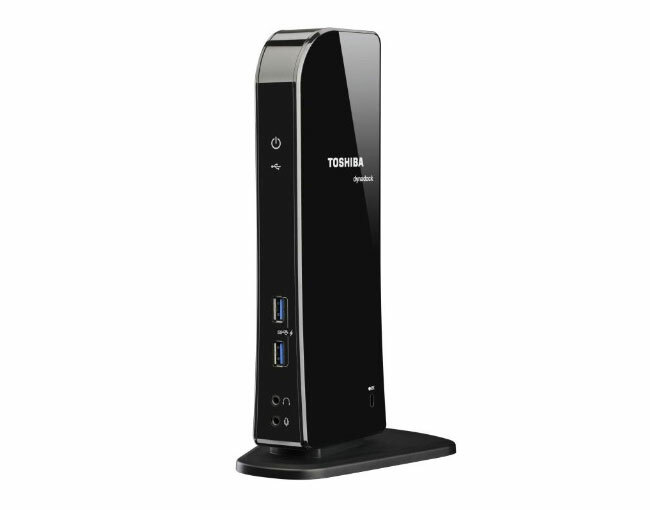 The new Toshiba Dynadock U3.0 is equipped with a total of six USB ports: 2 x USB 2.0 ports and 4 x USB 3.0 ports. Two of the included front ports are equipped with USB Sleep & Charge technology2. Allowing you to power up your smartphone and similar while the connected laptop is powered down, sleeping or undocked. The Toshiba Dynadock U3.0 also enables users to easily plug in all of their regularly used peripherals and have instant access to full-size devices including larger displays, external storage, an optical drive, a printer, scanner and more.